The Real Life of a Narrowboat Wife: Could You Live Aboard? There are almost 35,000 canal boats on Britain’s inland waterways*, but it’s quite difficult to estimate how many of those are floating homes. I was recently interviewed by a journalist who seemed to want to find out what ‘type’ of people are living within the boating community. The truth is that we are just as diverse as the community living ashore. Live-aboard boaters include middle-aged divorcees, retired couples, young professionals, people on low incomes, people ‘down on their luck’ and canal heritage enthusiasts. It can include people seeking an alternative lifestyle, or people seeking a cheaper lifestyle. Some boaters are foreign tourists discovering England and some people are able to choose a nomadic lifestyle because they work from home. If you think you may be one of these people you need to consider the challenges. Confined space and a lack of storage will mean de-cluttering your possessions before moving aboard. Have you taken into account the extra chores such as disposing of your own domestic waste and sewage, and keeping your water tank topped up? Are you ready for an unpredictable electric supply that depends on the engine being maintained in good working order? Your gas will be purchased in bottles and the changing price of red diesel will affect your home budget. If your work or personal commitments make continuously cruising impractical you will need to find a mooring. If you have considered all of these points then you are ready to take the plunge. Imagine the emotional freedom of releasing so many material possessions to move into a cosy narrowboat. Consider the sense of independence and achievement knowing that you are responsible for supplying your own gas and electric, and the environmental awareness you’ll gain when physically managing your own waste disposal. You’ll feel more connected with nature and feed swans and ducks from your kitchen window. You will learn to be economical with water and you may like to learn new skills such as marine engine maintenance, boat refurbishment or painting roses and castles. Will you exchange the gym for cycling or running on the towpath? Will you enjoy being part of a community in a marina or will you consider a new career as a roving canal trader? When you have thought through all of these things and worked out your budget it’s time to begin browsing the variety of canal boats for sale at Boatshed Grand Union. If you’re already a leisure boater looking to exchange your current boat for a live aboard we would be happy to take your boat on brokerage for you. I wrote this post for Boatshed Grand Union. To be fair what you haven't mentioned in this post is the wider option. Not everyone who lives on a canal boat wants to feel "confined," & doesn't have to. 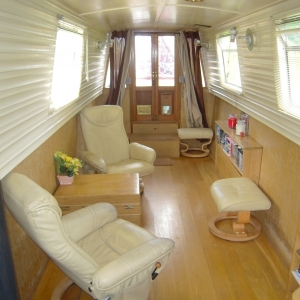 Quote: "Releasing so many material possessions to move into a cosy narrowboat." A widebeam offers twice the space & offers the option to keep twice the amount of personal possessions. Without being in a confined space, with full size appliances as a bonus. Oh, & it's also cosy & warm, & doesn't wobble every time someone moves.. We're both slim people so it's not a problem of being overweight! But all that wobbling about would be (a problem). We live on a widebeam with plenty of space, no feeling of being confined at all. I've also noticed many narrowboats haven't even got room for a (miniature) washing machine. Never mind a drier! Get used to using facility blocks or BW facilities out on the canal that don't work or are chained up! You may mention the fact that a widebeam can't cruise the whole system. Neither do most narrowboaters! Oh the number of people who live on a narrowboat, have come on our boat & said "why didn't we buy a widebeam, we never go very far anyway." You yourself have mentioned about how circumstances can dictate that continuous cruising is not an option. As one of our fellow widebeamers once said: "I'll be a long time dead in a 6 foot coffin, I'll be damned if I'm going to live on one!" Aside from learning the basic practicalities for any boat you've listed. A widebeam offers answers to many of the disadvantages you've mentioned. And therefore deserves to be included in this article. A nice photo of the interior of our boat placed next to the narrowboat photo would've been appreciated by many people looking for a canal boat. As far as I'm concerend live & let live, I have no qualms with narrowboaters - each to his own. But with the absence of choice on this blog post (which concentrates on buying a canal boat) concealing any mention of the wider option is misleading to newcomers. PS: In addition, let me make it clear that when people have said "we don't go very far", we are actually amazed at how far we CAN get. (Even further if we go on rivers) Far enough for the majority of folks. Thanks for taking the time to write such a detailed comment. I used the word 'confined' meaning that broadly speaking your average boat is a smaller space to live in than your average house and so some de-cluttering will have to be done. I don't feel confined in my narrowboat (which also has full size appliances, washing machine, heating etc.! )I did not mean to exclude widebeams, dutch barges, motor cruisers, or any other boat style from this article, but mentioned narrowboats as my blog is about living on a narrowboat! While a widebeam may minimise the storage space issue, prospective boat buyers will still need to consider the extra chores, electric, gas and diesel supply and other lifestyle differences that I mention, when considering moving afloat, regardless of which boat they choose. The problem is moorings, finding them and paying for them, mooring fees can be as much as monthly mortgage payments, its renting forever, at least with a mortgage you can eventually pay it off! continuous cruising is a bit restrictive IMHO, we all need to get off the cut from time to time, my husband and I love mountain biking and walking, I dont know how we would do this without a car. I "get" living on a boat, just not sure how practical or cheap it really is, probably neither. You are absolutely right, finding a residential mooring is difficult and they do seem expensive. I wrote here http://narrowboatwife.blogspot.com/2011/09/living-aboard-part-2-moorings.html about the option of having a (more affordable and available) winter mooring and then cruising in summer. We do this ourselves, and so when cruising in summer are often returning to our previous mooring to collect our car! Living on a boat is challenging in many ways, and in my opinion not particularly cheap (especially considering maintainance costs). I believe you have to be passionate about it to overcome the aspects that are difficult. Fancy a Happy Easter at Ellesmere Port? Now I'm a Page Three Girl!